Personality is a set of enduring traits and characteristics that relate to a person's emotions, motivations, interpersonal interactions, and attitudes. Personality is different from ability. Whereas personality may dictate attitudes towards situations or people, attitudes are transient and personality is enduring. Personality is meaningful to management, because employees' personalities may dictate how well they perform their jobs. Personality may indicate how hard a person will work, how organized they are, how well they will interact with others, and how creative they are. In recent years, more organizations have been using self-reporting personality tests to identify personality traits as part of their hiring or management development processes. Employers recognize that experience, education, and intelligence may not be the only indicators of who the best hire might be. Additionally, understanding one's own personality characteristics may improve one's ability to develop as an employee and manager. Therefore, it is important to understand the different facets of personality and the ways in which they can be measured. Research into the human personality has been conducted for many decades, and much of this work has focused on defining personality and understanding how many dimensions of personality there are. One primary area of agreement about personality is that it is a trait. That is, personality is enduring and unlikely to change substantially in one's adult life. Because personality is a trait, this also means that a person is likely to behave similarly in a variety of situations. This does not mean that a person cannot or will not adapt to a change in circumstances (e.g., behavior at work versus behavior in social situations), but that, on average, a person demonstrates similar personality across all situations and may behave differently from those with dissimilar personality characteristics. A major debate in the area of personality research is where personality originates, which is often described as the "nature vs. nurture" argument. Researchers who believe that individuals are born with a personality that is determined by genetics and remains unchanged regardless of environment, subscribe to the "nature" theory of the origin of personality. The "nurture" perspective is that personality is not determined by genetics, but rather by a host of environmental forces and personal experiences, such as geography, socio-economic status, and parental upbringing. Most scholars now agree that personality is determined by a combination of both genetics and environment, and that neither is solely responsible for personality. There are a number of different ways in which personality has been categorized, and different opinions exist about the number of dimensions of personality. Early tests of personality were developed to diagnose mental illness, and while some of these tests were used in employment settings, their acceptability and applicability were questionable. However, there are now tests specifically for use in normal adult populations, each of which is based on different conceptions of the dimensionality of personality. Some of the earlier tests used to assess the personality of job applicants and employees were the Minnesota Multiphasic Personality Inventory (MMPI) and the California Psychological Inventory (CPI), which is based on the MMPI. The MMPI was developed for psychological clinical profiling and includes ten clinical scales. While some of these scales may be applicable to predicting job performance in a selection tool, others are not. Additionally, the items used in the MMPI may be off-putting to job applicants. However, before the availability of personality tests commercially available for use in a business setting, organizations often used the MMPI to assess the personality characteristics of applicants and employees. Using the psychological basis of the MMPI, the CPI was created to assess the personality of normal adult populations. It assesses seventeen different dimensions of performance, including dominance, responsibility, empathy, and sociability. The CPI is much more appropriate for business settings than the MMPI, but was not created for use in business hiring. A different conception of personality is captured in the Sixteen Personality Factor Questionnaire, also called the 16 PF. It yields scores of sixteen different personality traits, including dominance, vigilance, and emotional stability. These sixteen factors can be combined to express five "global factors" of personality. These five global factors are often called the Big Five or the Five-Factor Model. Most researchers agree that while more than five dimensions of personality are present in human beings, nearly all of them can be subsumed within five: emotional stability, conscientiousness, agreeableness, extraversion, and openness to experience. They are summarized in Table 1. Emotional stability (also called neuroticism, when scored oppositely) involves a person's ability to remain stable and balanced. A person who is high in emotional stability is even-tempered, calm, and somewhat resistant to stress. A person who is low in emotional stability tends to be moody, depressed, and very susceptible to stress. 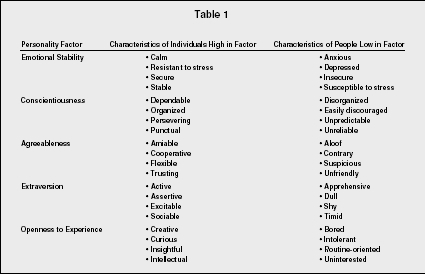 In most professions, a person who is high in emotional stability is preferred. Employees with low emotional stability are more likely to be distracted from work by stress, deadlines, or situations in their personal lives, whereas those with high levels of this trait are more able to control their emotions and feelings at work. Conscientiousness is a person's ability to be dependable, organized, punctual, and to persist in the face of setbacks. Research indicates that conscientiousness is the personality characteristic that is most related to job performance across a variety of jobs. Thus, in nearly every situation, a person who is high in conscientiousness will be better suited to perform a job. Individuals who are low in conscientiousness do not give much attention to detail, are likely to overlook deadlines, or may lose important documents. Additionally, individuals low in conscientiousness are more likely to give up when faced with challenges or difficulties in their work, whereas employees with high conscientiousness will continue to persist. Agreeableness, when high, indicates that a person is warm, friendly, and tactful. Low agreeableness is demonstrated when employees are cold, abrasive, and unfriendly. Preference on whether an employee high in agreeableness or low in agreeableness is somewhat dependent on the type of job. talk to and interact with in a group setting. And, in some jobs, being highly agreeable is an advantage, such as in sales, or in other jobs that require patient and friendly interactions with people. However, there are some jobs in which being too warm and friendly can be a detriment, such as a collections agent; and in these jobs, being low in agreeableness could be advantageous. Extraversion is how outgoing and social a person is. Someone high in extraversion enjoys crowds, social gatherings, and working in groups. A person low in extraversion is more comfortable working on his or her own and is less gregarious. As with agreeableness, the level of extraversion that is desired in an employee is dependent on the job. In jobs that involve interacting with others, such as sales, teaching, or public relations, high extraversion may be helpful. However, if a job requires independent work and solitude, such as computer programming, having a person high in extraversion may be difficult, and thus a person lower in extraversion would be preferred. Openness to experience refers to how open-minded a person is. An individual who is high in openness to experience is curious, imaginative, open-minded, and enjoys trying new things. People who are low in openness to experience are routine-oriented, close-minded, literal, and prefer not to try new things. As with agreeableness and extraversion, the degree to which an employee is benefited by openness depends on the job. High openness is important in jobs that require creativity and flexibility; you would definitely prefer to have high openness in advertising or research positions. However, some jobs reward routine work, and in those jobs in which creativity is not needed or desired, a person low in openness may find these jobs more rewarding. In summary, high emotional stability and conscientiousness are desirable in nearly all jobs, and the level of agreeableness, extraversion, and openness to experience are dependent on the job duties and requirements. While personality can relate to how well a person performs a job, it is not the only characteristic upon which a hiring decision should be made. Ideally, a person's education, experience, and intelligence should be evaluated for a position, with personality being part of the criteria considered. In addition to the 16 PF instrument, the Revised NEO Personality Inventory (NEO PI-R), developed by Costa and McCrae, assesses the five personality dimensions of the Five-Factor Model and thirty additional traits used to create the scores on these dimensions. For instance, to determine scores on the Neuroticism (i.e., Emotional Stability) scale, the following facets are measured: anxiety, angry hostility, depression, self-consciousness, impulsiveness, and vulnerability. This NEO PI-R was developed specifically for use in business settings. The Myers-Briggs Type Indicator (MBTI) is a very popular test, primarily used in organizations to develop managers and build teams. It is very different from the other personality tests. Rather than tapping the Big Five personality characteristics, the MBTI is based on the work of Jung and addresses four areas of personality to create sixteen distinct types. The four areas of personality are perception (sensing vs. intuiting), judgment (thinking vs. feeling), extraversion (extraversion vs. introversion), and orientation towards the outer world (perceiving vs. judging). The scores along these four dimensions can be combined to create sixteen different "types." The scores on each dimension represent the strength of dimension; so a person might be "sensing, thinking, introverted, and perceiving" and very strong in sensing, but somewhat less strong in thinking. While the other personality inventories are often used as a selection tool in the organization, the MBTI is best used for career development, counseling, and team selection. Another difference between the MBTI and other personality tests is that strengths on the different dimensions are all seen as valuable. So, a person who is strong in "thinking" is seen as just as skilled an employee as one who is strong in "feeling," but is believed to be more suited to different types of tasks and duties. Contrast this with the NEO-PI: on that instrument, a low score on some dimensions, like conscientiousness, would be undesirable to an organization. While the Myers-Briggs Type Indicator is used in many organizations and is very popular among employers and employees, there is not as much empirical evidence of its validity compared to other personality inventories. Thus, it is typically not recommended as a tool for employee selection, but rather is best suited for employee and managerial development and team-building. When employers first began to learn about personality and the impact that it could have on job performance, they did not have specific employment tests to measure personality. Therefore, many turned to psychologists and existing personality tests (e.g., the MMPI) to determine the characteristics of job applicants. Unfortunately, the purpose of some of these tests was to diagnose mental illness or psychological disorders, and although they could provide some information related to personality, the test items were likely to seem strange and intrusive to job applicants. Furthermore, because the tests were not written in an employment context, the information that they provided typically went beyond what was needed to make an informed hiring decision. For these reasons, many managers had negative experiences with personality testing in the workplace and thought it to be inappropriate and useless. However, there are now tests designed specifically for business hiring needs. These tests tap into the Big Five personality characteristics and are written in such a way as to not offend the average job applicant. Therefore, human resources departments should investigate which tests are available and most appropriate to their company before adopting personality testing. To use a personality test for selection, its reliability, validity, and acceptability must be evaluated. Reliability, or the degree to which a test measures some characteristic consistently, is a necessary requirement for a selection test. If a test does not measure consistently, then it cannot be valid; thus, assessing the reliability of personality tests is crucial for accurate selection. In general, most commercial personality tests have demonstrated high reliability. Reliability can be assessed in several different ways. The test-retest method of assessing reliability involves giving one group the same test twice and statistically evaluating the consistency of scores. Because personality tests are intended to measure stable, enduring personality traits, the test-retest reliability of these tests should be high. The equivalent measures method of determining reliability involves creating two tests that evaluate the same content domains, giving them to the same group, and statistically comparing the scores of each individual. If the two tests truly are equal in content, then high reliability will be indicated by very similar scores on both tests. Finally, internal consistency is one of the most used measures of reliability. An assessment of internal consistency only requires one version of a test and one sample of people; the test is then broken into two parts, and the consistency of responses on the two parts is determined. A well-known form of the internal consistency approach, called coefficient alpha, averages the correlations between all possible splits of a test, and therefore results in a highly accurate assessment of reliability. The validity, or accuracy, of personality tests has been measured in a number of research studies and can be assessed in two main ways: content validity and criterion-related validity. Additionally, meta-analysis has been used to understand the validity of personality tests. Content validity is an assessment of the degree to which the items on a test capture the domain of interest. This assessment is made by subject matter experts, such as trained psychologists or expert managers. While content validity is an important assessment of the usefulness of a selection test, criterion-related validity provides empirical evidence as to a test's accuracy. Criterion-related validity indicates how well a test predicts job performance, and it can be evaluated concurrently or predictably. In a concurrent criterion-related validity study of a personality test, job incumbents are given the personality test, and their job performance is measured at the same time. A correlation between test scores and job performance indicates the level of validity of the new test. With predictive criterion-related validity, job applicants are given the new personality test, but it is not used when making the hiring decisions. After a certain time period, the scores on the personality test are correlated with job performance scores of the new employees to determine the validity of the test. While concurrent validity studies are often preferred because they can be done quickly, the motivation of current employees to do well on these tests may not be high, or at least not as high as the motivation of job applicants. With predictive validity, the benefit occurs with the use of actual job applicants; however, the time lag involved is often a major drawback. In both cases, a big concern is range restriction; that is, because the full range of scores on the test is not evaluated (since not all applicants are hired and, presumably, current employees would have high scores on the personality test), the actual validity of a test may be underestimated. Meta-analysis is a statistical technique that can be used to further explore the validity of selection tests. Meta-analysis combines individual research studies to indicate an overall average validity for most jobs; using this, the general validity of selection tests can be estimated. Based on information from meta-analysis, most personality tests have low to moderate validity, as compared to other selection methods such as intelligence tests, work samples, and structured interviews. However, they are still useful for hiring in many jobs because the information they provide is unique. Intelligence tests and work samples cannot indicate a person's level of different personality traits, and although structured interview questions may be written to capture some elements of personality, such as conscientiousness, or agreeableness, typically, a personality test will provide information above and beyond other employment tests. Therefore, the inclusion of a validated personality test may increase the overall validity of the selection battery for certain jobs. There are three major threats to the validity of personality tests: faking, socially desirable responding, and careless responding. While all occur for different reasons, the effects of these types of responses can reduce the validity of personality tests. Faking occurs when a job applicant purposely attempts to score more positively than he or she would if answering items truthfully. Because many personality inventories include response choices that are easily seen as more desirable than others, applicants may be able to deliberately misrepresent themselves to look more favorable, or "fake good." Although most personality tests include instructions that request that applicants answer truthfully, they may choose not to follow these instructions. There are no firm conclusions on the amount of faking that occurs, or its effect on test scores, but many researchers argue that when faking occurs, it is unlikely to skew test appreciably. Socially desirable responding is similar to faking in that the applicant answers items falsely in order to look better; however, unlike faking, socially desirable responding is not deliberate. These unconscious and unintended responses are chosen in order to conform with social norms. For instance, an applicant may overestimate his punctuality or organization skills on a personality test because these are skills that the employer wants. However, this decision would not be conscious, but instead would represent a generous view of one's own habits. Response carelessness occurs when an applicant does not pay careful enough attention to the items on the test and therefore responds incorrectly. This occurs when the applicant has poor reading skills, is in a hurry, is bored, or is not motivated to take the test. Careless responses can harm the reliability and the validity of the test because they lack consistency and accuracy. To avoid these problems, many personality inventories now include scales to detect faking, socially desirable responding, and response carelessness from which scores can be used to adjust the scores on the other scales. Thus, most published personality inventories have the means to avoid and/or correct for these threats to validity. Acceptability is an assessment made by job applicants. Their reaction to taking the personality test may have an influence on their motivation to take the test, their continuation in the hiring process, or their opinions about the company. For example, if a job applicant is asked a number of questions on a personality test that she believes to be invasive and too personal, she may be offended and therefore not accept a job offer. She may then complain to friends about the company's selection tests—reducing the number of people who might have applied for jobs with the organization. Any of these outcomes are likely to hurt recruitment and selection efforts, and thus, only tests with high levels of acceptability should be used. Understanding personality can be useful in the workplace. There are many commercial personality tests available that can be used for selection. Many of these are high in reliability and have low to moderate validity. Many tests are written specifically for business settings and are likely to be deemed acceptable by job applicants. Research supports the use of tests based on the Five-Factor Model of personality for selection. The Myers-Briggs Type Indicator, a very popular inventory, can be useful for development and team-building in the organization. Anastasi, Anne, and Susana Urbina. Psychological Testing. Upper Saddle River, NJ: Prentice Hall, 1997. Barrick, Murray R., and Michael K. Mount. "The Big Five Personality Dimensions and Job Performance: A Meta Analysis." Personnel Psychology 44 (1991): 1–26. Gardner, William L., and Mark J. Martinko. "Using the Myers-Briggs Type Indicator to Study Managers: A Literature Review and Research Agenda." Journal of Management 22, no. 1 (1996): 45–83. McCrae, Robert R., and Paul T. Costa, Jr. "Validation of the Five-Factor Model of Personality Across Instruments and Observers." Journal of Personality and Social Psychology 52, no. 1 (1987): 81–90. McFarland, Lynn A., and Ann Marie Ryan. "Variance in Faking Across Noncognitive Measures." Journal of Applied Psychology 85, no. 5 (2000): 812–821. Schneider, Benjamin, and D. Brent Smith. Personality and Organizations. Mahwah, NJ: Lawrence Erlbaum Associates, 2004.